Every once in a while we love to make a big turkey dinner, but we always end up with a bunch of leftovers. One great way to use up all the extra turkey is to throw it into this hearty, comforting casserole. 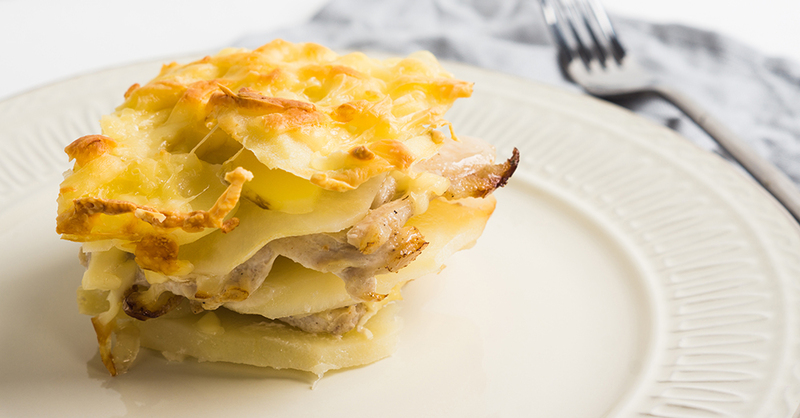 Sort of in the same vein as a traditional gratin, the potatoes taste like hash browns after baking in the oven and the melted cheese oozes deliciously over the turkey. With just a few additional ingredients, we have a great-tasting dish. Serve this to your family and watch them scarf it down! Preheat oven to 350º F. Melt 4 tablespoons butter in a skillet over medium-high heat, then add potatoes and garlic and cook for 10-15 minutes, or until softened. Grease a 9-by-13-inch baking dish with remaining butter. Place half of the potato garlic mixture in the bottom of baking dish. Spread turkey evenly over potatoes and season with salt and pepper. Cover with remaining potatoes. Whisk together milk, eggs, mustard, flour, salt and pepper in a large bowl. Pour evenly over the potatoes. Bake casserole for 1 hour or until potatoes are tender. Remove from oven and sprinkle cheddar cheese on top. Place casserole under broiler and cook for another 5 minutes, or until cheese begins to brown. Remove from oven and let cool for 5-10 minutes before serving.